There are just some recipes that are too good to adjust or tweak, and I wanted to give them a hearty shout out on this blog. Here are a few winners I’ve made recently. 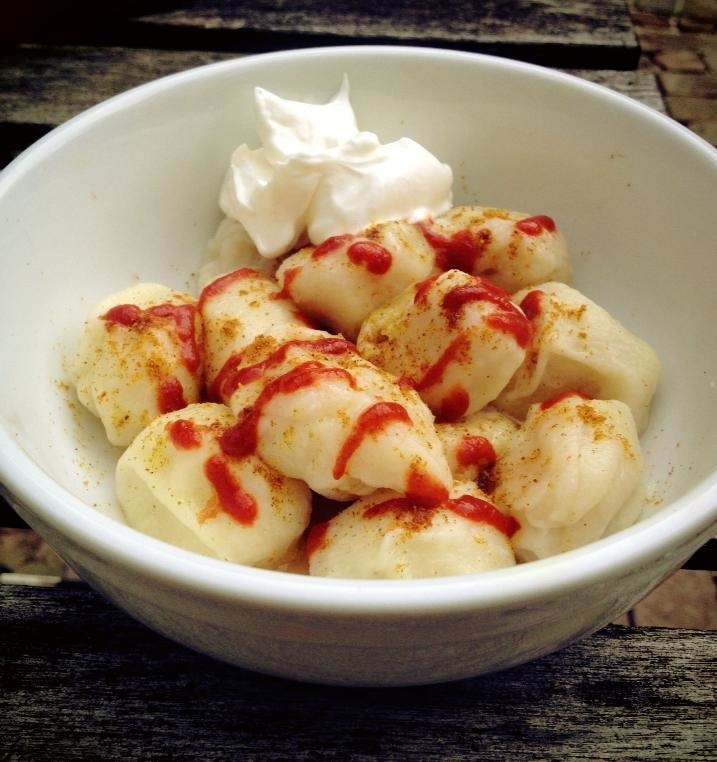 Russian pelmeni with a sprinkle of curry powder, Sriracha, and a dollop of sour cream. For a brief time when I was in college, there was this awesome little pelmeni restasurant in my hometown that made exclusively…you guessed it, pelmeni. Sadly, it shut down a few years ago but the cravings for pelmeni have not stopped. Finally, at last! 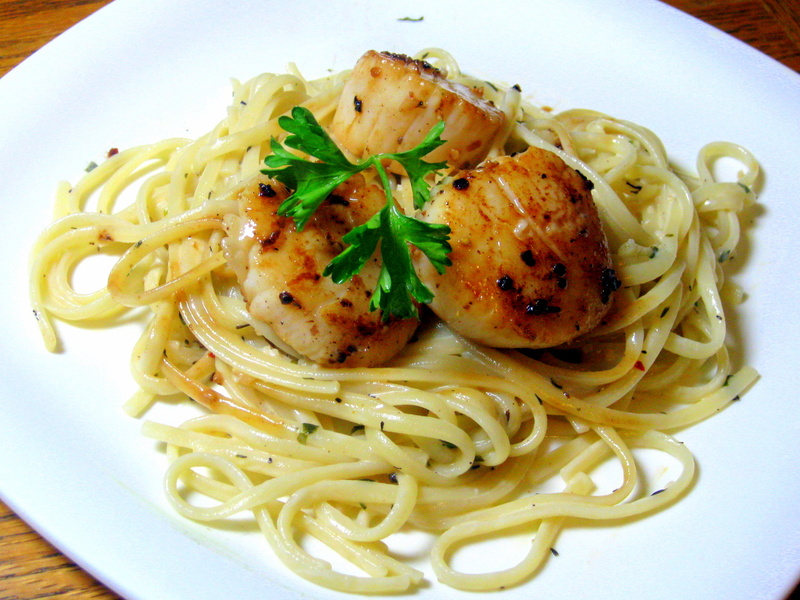 Natasha’s Kitchen provided me with a recipe that resulted in closest approximation. This recipe calls for chicken, but you can make it with any filling you’d like (I like just a bit of seasoned potato). I made mine by hand the first time around, and while it was worth it, it was also pretty time consuming. Next time, I’m getting myself a mold. 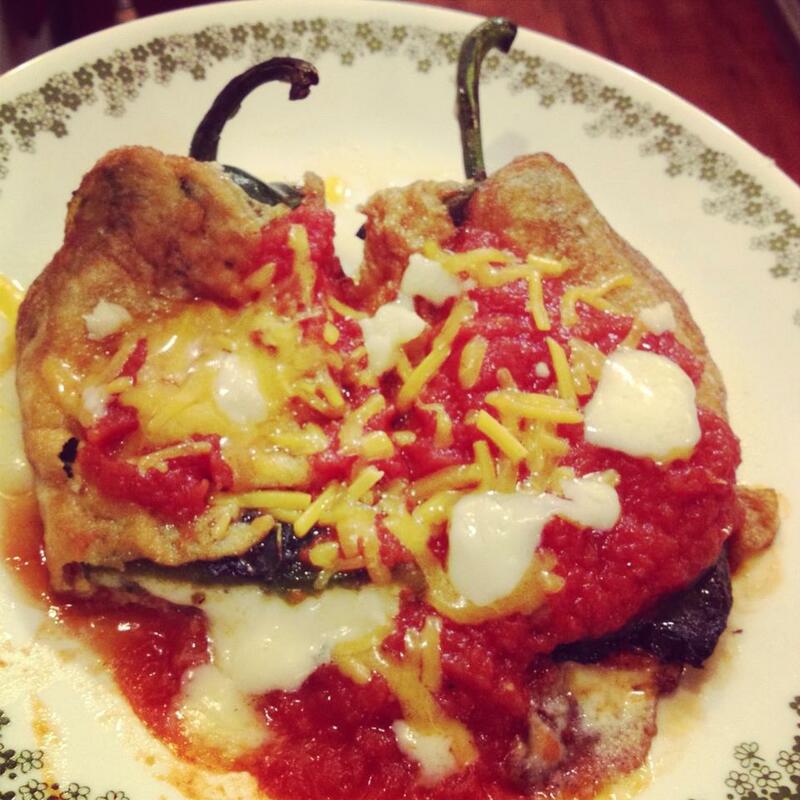 I fell in love with chiles rellenos during the two years I lived in Tucson, Arizona. After moving to the east coast, it seemed I would have to give up on them altogether. I couldn’t find it in many restaurants for some reason, and in the few where I tried it, they were either still frozen in the middle or the “breading” was wrong. However, on my honeymoon last fall my husband and I stopped at this little town just outside of San Francisco for dinner and I tried once more, figuring that restaurants knew how to do it right out West. And was I right! I figured if I wanted some myself I’d have to make it. 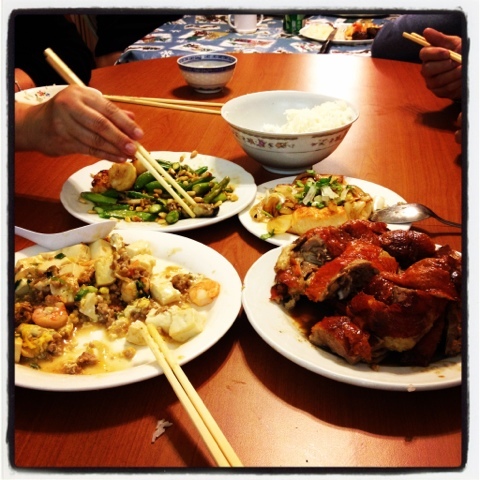 CHOW provides a king-making recipe, and taught me the secret–the “breading” is not bread, but rather fried egg batter. Genius! These reminded me of the cheddar bay scones at Red Lobster, but home made and a lot less fattening and greasy. I was on a scone making tear last night. I started out thinking only in terms of sweet–I have a go-to recipe on Epicurious.com that is so easy to customize. This night I decided to make raisin and lemon scones and lavender and lemon scones. This was mostly because this was what was available in my pantry. But spring has arrived here in Baltimore, and I some of my herbs from last season have made a comeback. 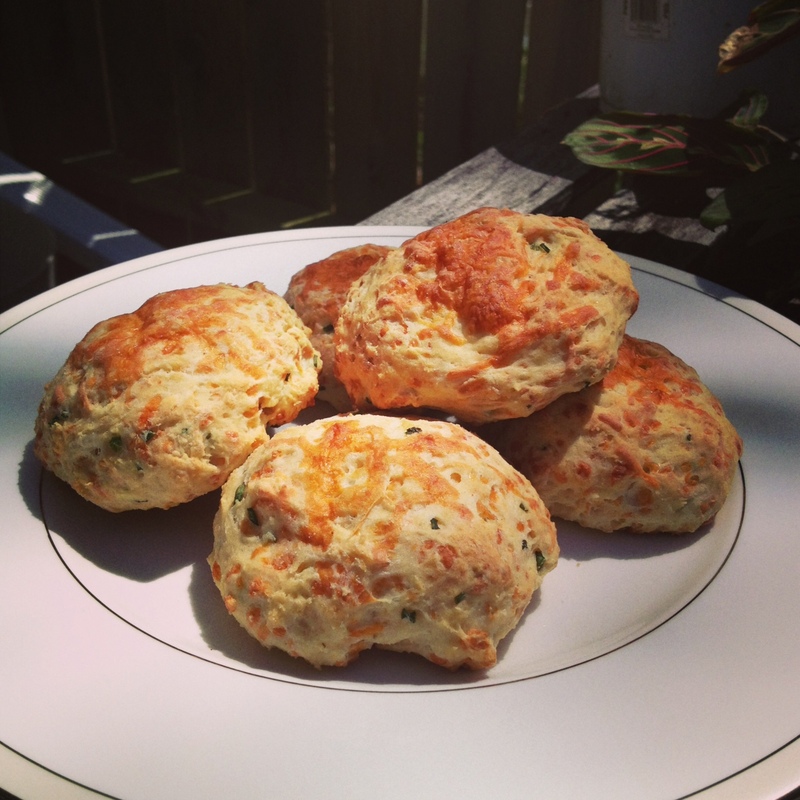 The one that has thrived the best so far were my chives, and so looking into my fridge, I got an idea–how about some savory scones? Get all the ingredients out and just knock three types out while the oven is literally hot? I marinated whole chicken thighs here, but you can also use boneless thighs or breasts, or try beef, pork, or even tofu (though maybe pan fry instead of grill it). It’s finally spring, at least technically it is, and for many people that means it’s time to pull out the grill and get in some outdoor cooking. This is one recipe I’m ready to fire up all year round, though. In fact, that’s exactly what I did this past January. I live in Baltimore, and as you may have heard, the Baltimore Ravens won the Super Bowl this year. 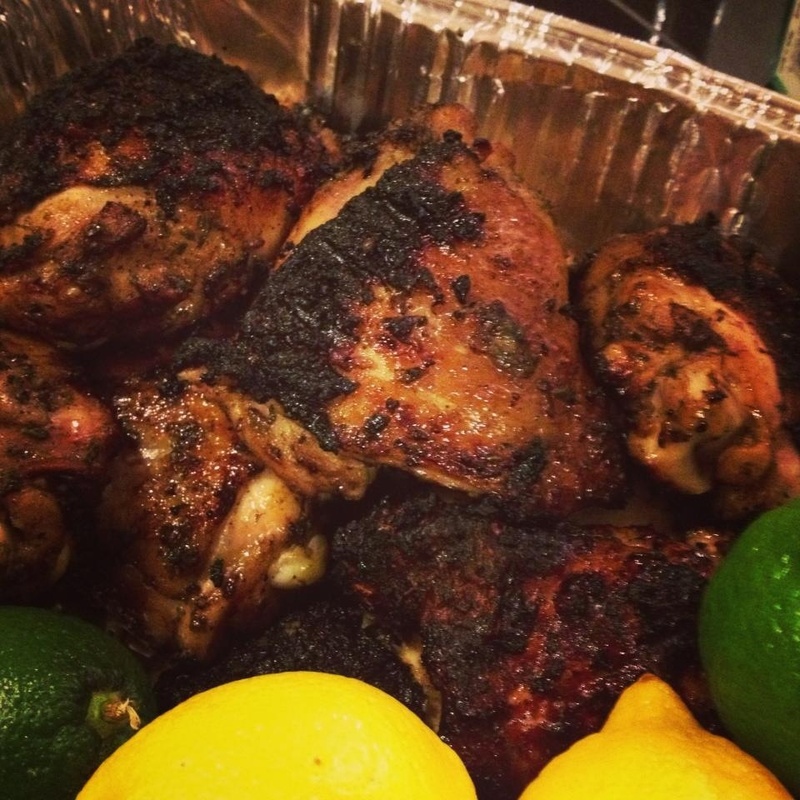 Leading up to the big game though were other big games, and for at least two of them, I whipped up this grilled chicken recipe for the get together. While it was hard to fire up the charcoal grill in 30 degree weather while the wind was fighting me as I was trying to light the briquettes, I did win out in the end. While I’ve used this marinade with chicken thighs, it can be applied to other cuts and other meats as well (I plan on trying this with beef next, and who knows, maybe it would also work with tofu?). I prefer the thighs, though, because they are more flavorful than breasts, and are more moist on the whole. Sorry for the lack of posts! Real life has gotten busy. In the last year I’ve gotten engaged and as of last week, started down the road to buying my first home with my fiance. Between house hunting and wedding planning, food blogging has fallen to the wayside. But here is an attempt to get back! So I think I wrote about my obsession with Korean dramas recently, and it continues. And because I continue to watch these dramas, every time I see the characters eat Korean food I suddenly crave it. 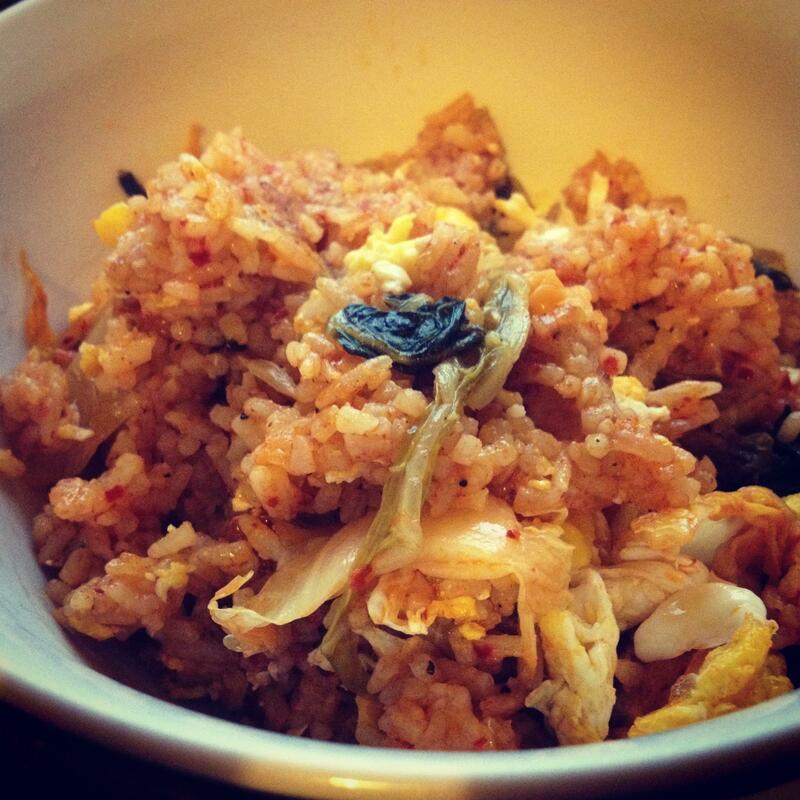 First, it was all about bibimbap, and now my obsession is kimchi fried rice. Kimchi fried rice is spicy and sour and buttery and oh so good! I grew up with Chinese fried rice, but never kimchi fried rice, and man, I was missing out! Kimchi fried rice is a good way to use up leftover kimchi, but honestly, I’d buy a fresh batch of it just to make this recipe. 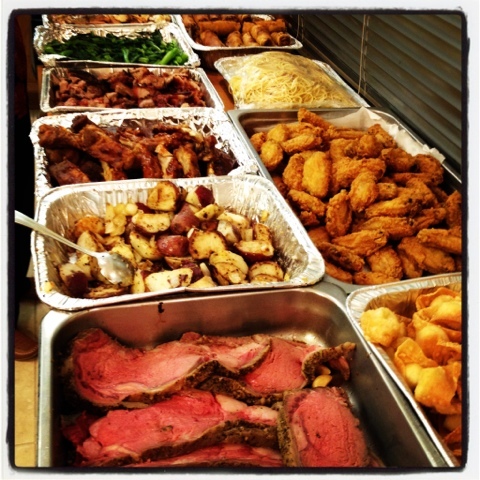 This was how my family feasted this Christmas Eve and Christmas day. I hope all of you had a wonderful holiday! And I hope it was full of delicious food and good cheer! I made chocolate chili cupcakes last night because I had some leftover chocolate ganache (#firstworld problems, am I right?) and this was the result. Not bad. There’s a nice spicy finish that you don’t notice until you’re just finishing it up, but it’s definitely there. Ancho chiles will give you some more depth of flavor, but if you don’t have it, just heap on a little bit more of cayenne pepper and you’re all set. 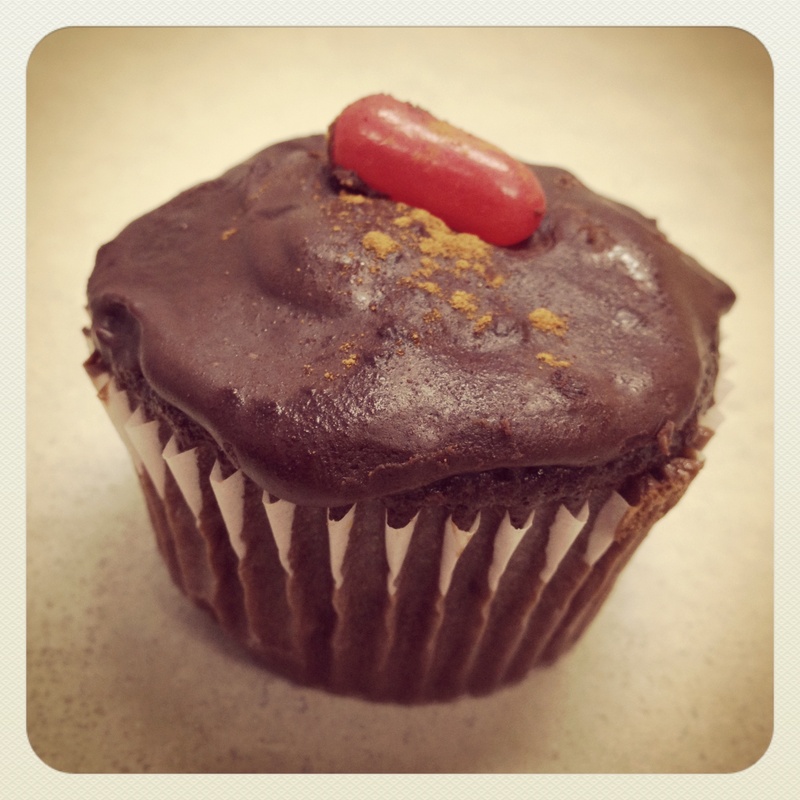 Topped with chocolate ganache, a dusting of cinnamon, and a Hot Tamale. Want the recipe? It’s below the cut. I don’t eat pasta very much (though I eat Asian noodles more often), but it was actually Asian dramas that inspired me to make this dish. How’s that possible, Rice? you might be asking yourself. Made with fresh herbs from my rooftop garden. So a little disclaimer about this post: I’m not really a fan of rabbit. It’s not that I object to the taste of it. It’s just that…there’s history. 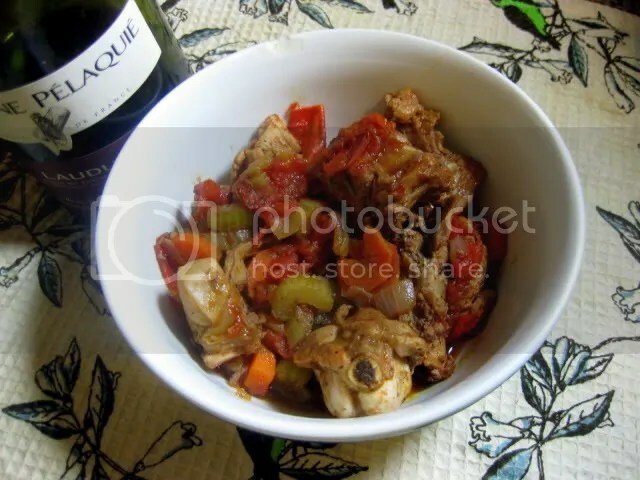 Fresh rabbit cooked with farmers' market fresh vegetables. When I was a little girl–about seven or eight years old–my parents drove down the street from my Wisconsin home to a nearby far. There my father purchased two bunny rabbits and brought them home. In our backyard he built a hutch from two-by-fours and chicken wire and the rabbits moved in. One was a black rabbit with sleek ears, and I named him Checkers. The second rabbit was a brown bunny, her fur almost like a tabby cat’s, save for a puff of white fur that served as her tail. I called her Cottonball. My siblings and I would go visit the hutch regularly and drop in offerings of carrots and lettuce for them to eat. Eventually, the bunny family expanded and there were a dozen tiny little bunnys–black, white, and brown–hopping around. For my birthday party that winter, I brought in a box of bunnies into the house and let them hop around inside to entertain myself and my friends. But then one day I went out to the hutch and Checkers and Cottonball were gone. The bunnies were all there, but where where the original two? I ran inside searching for my parents, but the search ended quickly when I walked into the kitchen and saw my grandmother hard at work at making dinner. Some people don’t eat vension because of Bambi. I didn’t eat meat for weeks after that incident, and for the next twenty-two years, I never had any desire to eat rabbit. But things change, and, the boy (now the fiance) does enjoy rabbit. So if you survive this story of childhood woe and are still interested in this recipe, continue reading! My team, the Green Bay Packers, play in today’s Super Bowl. And I’m going to attempt to fry cheese curds. Wish me luck. 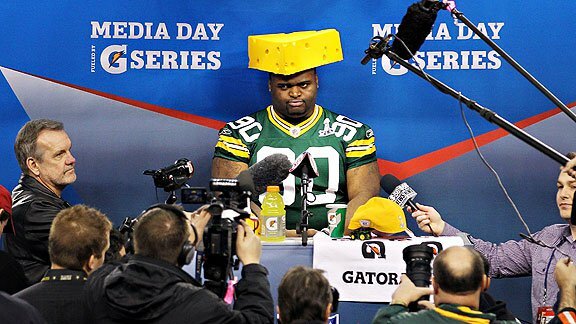 Wish the Packers luck (unless you’re a Steeler’s fan, in which case, you are dead to me). I think I loved gnocchi the moment I tasted my first little potato pillow. I’d been craving potato dumplings. Back in my hometown of Madison, Wisconsin, there was this little restaurant downtown on State Street that sold pelmeni, or Russian dumplings. Some were filled with ground sirloin, and others were filled with potato. Covered with dusting of curry powder and squirts of spicy-sweet Srichara, it was perfect for lunch, dinner, or after a night out at the bars. But then I moved away to Tucson, Arizona (and sadly, the restaurant eventually closed so when I go home it is no more) and I wasn’t sure where I’d get my fix. Of course I attempted to make pelmeni myself, but I was still growing as a cook then and it turned out pretty disastrous. Before I boiled them the dumplings were about the size of a Superball. Neat little balls of dough filled with mashed potato season and salted. But a few minutes in a boiling water caused them to go supernova. The potato burst out of the dough. The dough quadrupled in size and suddenly I was faced with a pot full of potato bits and doughballs the size of baseballs. I still ate it of course, but needless to say, it wasn’t the same. This gnocchi is seriously easy to make, especially if you use potato flakes...yes, potato flakes. Enter Trader Joe’s. Enter gnocchi. I spotted them in the freezer section (they’ve recently been vacuum-sealed and moved to the past section) and seeing “potato” and “dumpling,” I went in for it. They were pelmeni, but that day another food love affair began. I served them with curry powder and Sriacha. I combined them with kielbasa and vegetables. Just last night, I cooked them up and served them with a Boursin garlic cheese sauce with grilled portobella mushrooms. But last night’s dish didn’t involve Trader Joe’s. I’ve gone rogue, you see. 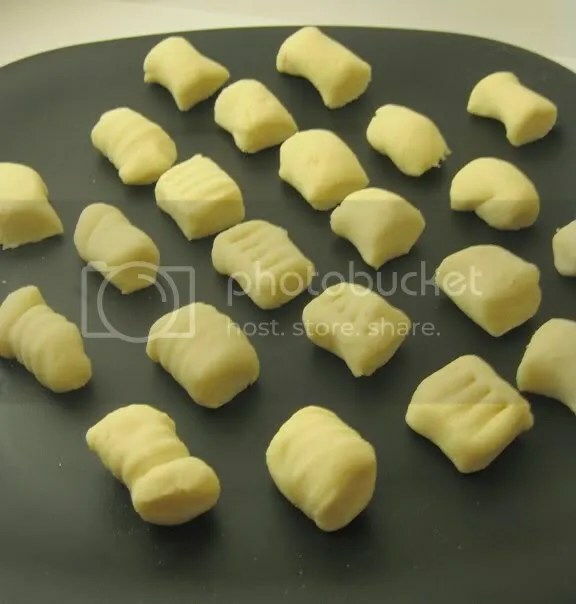 I make my own gnocchi now. In June of 2009 my boyfriend and I went to Rome. On our last night there, my boyfriend’s brother and his girlfriend (who were living in Trastevere at the time) took us for one last great roman meal. We went to the a restaurant in Rome’s Jewish ghetto, a wonderful, dreamy place called Il Giardino Romano where I watched a man peeling crate after crateful of fresh artichokes (we ordered fried artichoke hearts for an appetizer) while we waited for our meal. I ordered the gnocchi in a fontina sauce, and the first bite I won’t ever forget. Soft. Pillowy. Delicious. Sorry, TJ’s, I love you, but you just don’t compare. Homemade gnocchi, friends, that what I bit into.